First I need to call your attention to the tiny white rectangle in the upper left quadrant of the above picture… That’s an iPhone, and the rest of the picture is the speaker dock. Yes, I agree, a picture that included a small car might have brought the whole size thing into a bit more focus, but we work with what we have. Suffice it to say, this thing is huge. 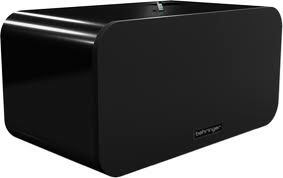 This enormous speaker system measures a ridiculous 8 feet wide by 4 feet tall and weighs in at more than 700 pounds. This steroidal system offers up a deaf defying (yes, that was on purpose) 10,000 Watts and over 130 decibels of mind numbing, chest thumping power. The threshold of pain comes it at around 120 decibels, just thought you should know. The dock comes equipped with a 30-pin connector on top of the unit that allows you to connect your iPhone or iPod touch and, luckily, in case there isn’t enough room to connect your iDevice, the speaker also has Bluetooth connectivity in order to play your audio selections wirelessly from any iPhone, iPod touch or most other Bluetooth compatible devices. Look inside this gigantic monster dock and you will find a 3-way system with two 18-inch sub-woofers, dual neodymium mid-range woofers, and two titanium-diaphragm compression drivers for pumping out the high notes (think glass breaking). Look closer, and you’ll see me living in it, with a $30,000 price tag I’ll have no choice. While not yet listed on the Behringer website, it is technically available… I may need to wait for the iNuke Boom 2… maybe the prices will come down a bit.